Another good year for the undertaker? Tzipi Livni was just elected head of the ruling Kadima Party in Israel. Does this portend change or more of the same? Well, the alleged outlaw, Ehud Olmert, awaits indictment, probably on charges of fraud, abuse of public trust, maybe bribery, too. The evidence draws a portrait of a man committed to the good life and political aggrandizement, but it does not point to a major scheme for financial bonanza. Olmert was not toppled because of corruption (Sharon and Arafat both maintained their popularity through multiple corruption scandals), but because he delivered to Israel its first loss at war – in Lebanon, of course. 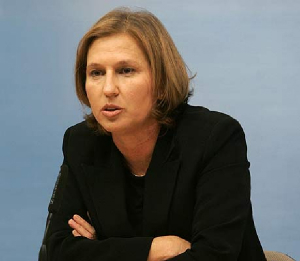 And now Tzipi Livni – scion of a militant dynasty, graduate of Mossad covert operations, protegee of Arik Sharon – was elected head of the ruling party in Israel, and she too talks about change, a new way of doing politics, a preference for peace over territory. This is not a course correction, but the deepening of a direction that had been taken by Sharon and reinforced by Olmert, his successor. All three had been staunch advocates of “the greater land of Israel” ideology until recent years. Investing in the occupied territories had been a mistake, a long and expensive mistake, said Olmert this morning in a post-election interview. But can we count on Livni to do the right thing, to sit down and negotiate a peace that will be acceptable to both sides – a two-state solution that shares Jerusalem as the capital, a just and viable scenario for the Palestinian refugees, an equitable distribution of water resources, investment in the development of Palestine to ensure its economic viability? Tzipi Livni is not Mother Teresa nor the Dalai Lama. She probably more closely resembles Alfred Nobel himself, once called a “merchant of death” for inventing and commercializing dynamite. Livni, too, served the military establishment in Israel until she left it for a law career. What made her leave? Rumors abound, but Livni is reticent about this as in other areas. Will she, like Nobel, also seek a place in history by making up for years of feeding the war machine? Livni will have many obstacles, the first being to forge a government coalition that will include partners who are not on her side. Then she will have to overcome the deeply rooted existential fear of Israelis, which peace-making evokes. Finally, she will have to take risks of substance, facing down the Israeli warlords, standing up to settlers with their implied threat of a divisive and bloody civil war. Two years ago, Livni was the only Israeli cabinet member who spoke out against launching an all-out war in Lebanon at a moment when a frenzy of vengeance and nationalism gripped the entire nation. Can we expect more such political and moral courage? Dare we be hopeful? Or will it again be another good year for the undertaker?